Matka Gosht recipe by SumeraNawed at PakiRecipes.com. Matka Gosht is great for stewed lamb curry and also called Kunna.But to me lamb can be alternated with beef too its very easy to make n you not really need any special ingredients to make it.Try it once n you will love it. Flour 2 tbsp mix in 1/2 cup of water to make a paste. Green chilies and fresh coriander leaves for garnishing. Heat oil in a pan or a clay wok or pot. Add thinely sliced onion and fry until golden brown. Add mutton n fry for few minutes. Then add ginger and garlic paste and fry meat in it for 5 min or until it leaves oil. Add all the spices except garam masala n flour. Fry for few more minutes. Put 3 glasses of water n let it cook until the meat tenders. Fry for few minutes until it leaves oil. When the meat is tender add the flour paste. Put 1 cup water and cook for 10 minutes. 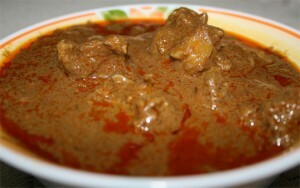 Matka gosht or Kunna is ready to be served. Garnish with green chilies and coriander leaves . Serve hot with tandoori naan.Enjoy!!!!! NICE! I added a pinch of crushed black Zeera. Came out good. When to add garam masala?